Because they are among the most diverse ecosystems, coral reefs are essential to thousands of oceanic species, and people also rely on them for food, protection and even income1. It seems to be common knowledge that climate change is having devastating effects on oceanic wildlife, and those effects extend to killing coral reefs. 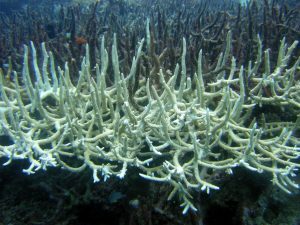 While most people might understand that climate change, specifically higher water temperatures, can cause destruction of coral reefs, the term “bleaching” of the coral is probably a new concept. While some environmentalists are familiar with that term, most people are not really aware of what is happening during bleaching. Corals are hosts to symbiotic algae, called Symbiodinium, which provide most of the food for the coral through photosynthesis2. In a symbiotic relationship, two beings (in this case the coral and the algae) mutually benefit from living together in close proximity. The plantlike algae gains an appropriate living space and the coral benefits from having its dinner close by. 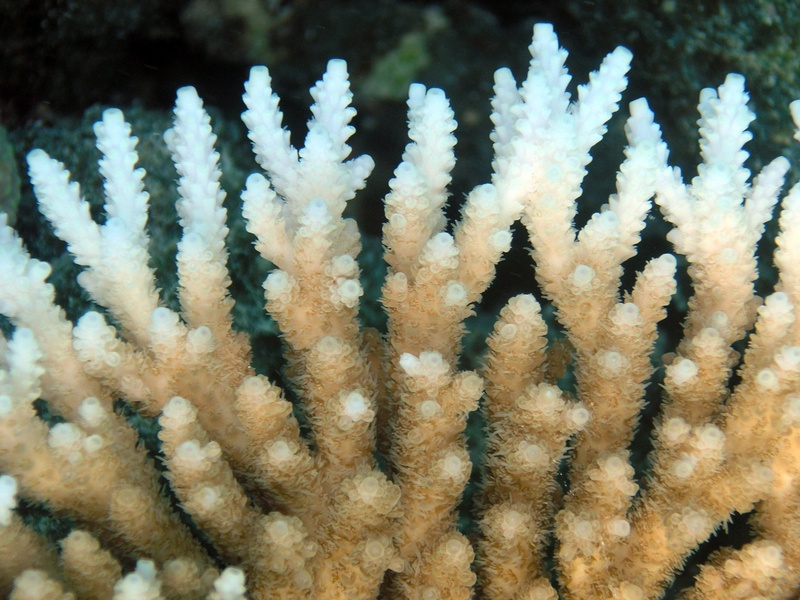 Under different stressful conditions, including high temperatures, coral expel their symbiotic algae and turn white, which is called coral bleaching as shown in figures 1 and 22. Without the algae, the coral no longer has its major source of food and is susceptible to disease and death. 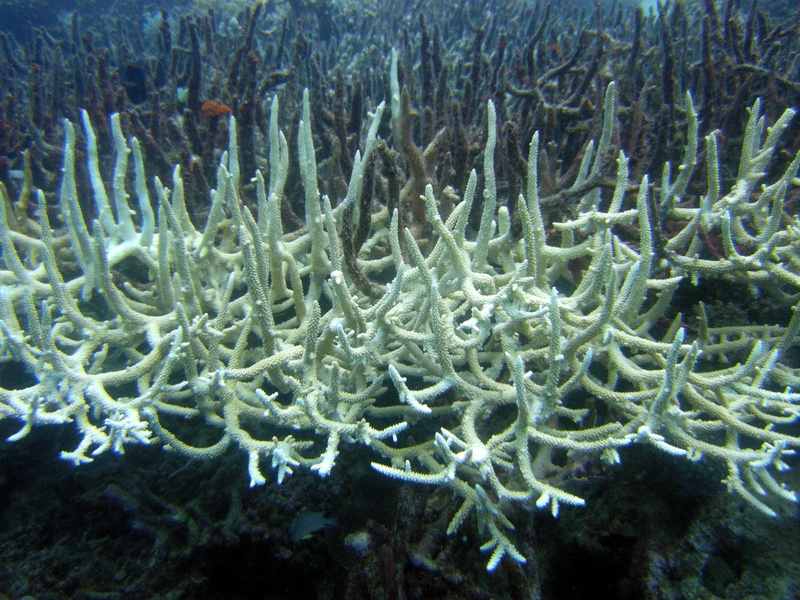 Figure 1: This coral has been bleached at the tips. The tips are white and no longer contains its Symbiodinium while the bottom is brown and still has its Symbiodinium. Photo by Oregon State University. Licensed by CC BY-SA 2.0. Figure 2: This coral colony is completely bleached. Photo by Matt Kieffer. Licenced by CC BY-SA 2.0. A recent study by Derek Manzello suggests that the warming of coral reefs has been under-estimated3. In his research, he analyzed temperature records of the Florida Keys to calculate average daily and monthly temperatures and the rate of seasonal warming3. He found that the average number of days per year where the temperature reached over 31.5oC (88.7 oF) has increased over 2500% from the 1990’s to the present compared with the 1970’s to the 1990s3. These temperature analyses show that thermal stress is increasing annually and predict that the reefs will bleach annually, starting sometime between 2020 and 2034, which is earlier than previously predicted3. In the past, the prevailing thought was that bleaching would begin to occur sometime around 20503. Given that temperatures on reefs are rising quickly and temperature is an important stressor that leads to coral bleaching, do the corals have any means of defense against climate change? Many studies have looked at temperature sensitivity in corals and have found that different factors affect a coral’s sensitivity to temperature and subsequent bleaching, including temperature, nutrients and light. Variation in bleaching susceptibility has been found between different coral species, between conspecific (individuals of the same species) corals housing different species of symbiotic zooxanthellae (algae that use photosynthesis to produce nutrients), and even between conspecific and congenetic (individuals with the same genetics) colonies found at different locations4. Hoping to understand differences in temperature sensitivity, Ulstrup, et. al.,5 compared the thermal tolerance of corals of different species, found at different geographic latitudes, and housing different symbiotic companions. In their experiment, samples of two corals, Pocillopora damicornis and Turbinaria reniformis, were taken from different sites on the Great Barrier Reef, and then were subjected to different temperatures for different time periods in the lab5. After subjecting them to these stressful conditions, the researchers recorded the coral’s mortality rate, symbiont density (the amount of symbionts in the coral tissue), and photochemical efficiency (or how well the symbionts created food) with respect to the different temperature treatments5. They first found that T. reniformis was more resilient to higher temperatures, dying at a temperature 2oC (3.6o F) higher than P. damicornis. They also found that corals found at a higher latitude bleached faster, and at lower temperatures, than those found at lower latitudes5. They believe the reason for this difference is local adaptation – lower latitude corals are naturally exposed more to higher temperatures than higher latitude corals and therefore have adapted to be able to handle slightly higher temperatures5. Finally, this study showed that the symbiont Symbiodinium clade D is more heat resilient than Symbiodinium clade C and that corals that did not have clade D were more sensitive to higher temperatures5. The term “clade” simply refers to a group of zooxanthellae that has arisen from one common ancestor, so apparently the clade D-containing corals had adapted themselves and their symbiotic algae to be more heat resilient. A previous study by Dr. Rob Rowan6 also showed that Symbiodinium clades C and D differ in their heat tolerance. He suggests that corals housing Symbiodinium clade D may be able to better adapt to rising temperatures. While these differences in temperature sensitivity are small and may seem insignificant, they may actually be very important to saving the reef from warmer waters caused by climate change. Drs. Ruth Gates and Madelein van Oppen7, 8 are helping corals adapt to higher temperatures by exposing them to such temperatures in a lab before attempting to transplant them to reefs in Hawaii and Australia, a technique called “assisted evolution.” The success of these experiments is yet to be determined. Coral reefs are a very important part of the ocean ecosystem and are important to many people whether for food, source of income, or just the beauty and biodiversity associated with reefs. Although these new methods may help the corals better adjust to higher sea water temperature, the issue of climate change still needs to be addressed if the coral reefs are to survive long term. The increased timeline proposed for coral bleaching should be a major red flag that climate change must be addressed sooner rather than later. US Department of Commerce, N.O. and A.A. What is coral bleaching? http://oceanservice.noaa.gov/facts/coral_bleach.html. Manzello, D.P. (2015). Rapid Recent Warming of Coral Reefs in the Florida Keys. Scientific Reports 5, 16762. Fabricius, K.E., Mieog, J.C., Colin, P.L., Idip, D., and H. Van Oppen, M.J. (2004). Identity and diversity of coral endosymbionts (zooxanthellae) from three Palauan reefs with contrasting bleaching, temperature and shading histories: CORAL-ZOOXANTHELLAE ASSOCIATIONS IN PALAU. Molecular Ecology 13, 2445–2458. Ulstrup, K.E., Berkelmans, R., Ralph, P.J., and Van Oppen, M.J. (2006). Variation in bleaching sensitivity of two coral species across a latitudinal gradient on the Great Barrier Reef: the role of zooxanthellae. Marine Ecology Progress Series 314, 135–148. Rowan, R. (2004). Coral bleaching: Thermal adaptation in reef coral symbionts. Nature 430, 742–742. Riley, A. The women with a controversial plan to save corals. http://www.bbc.co.uk/earth/story/20160322-the-women-with-a-controversial-plan-to-save-corals. Oppen, M.J.H. van, Oliver, J.K., Putnam, H.M., and Gates, R.D. (2015). Building coral reef resilience through assisted evolution. PNAS 112, 2307–2313. This entry was posted in Uncategorized and tagged 2017, bleaching, Climate Change, coral, Laura, temperature. Bookmark the permalink.